Throughout the 1970s, a young generation of Ukrainian Canadians worked on solidarity campaigns for political prisoners in the Soviet Union. Challenging states' monopoly on east-west dialogue is still important today. 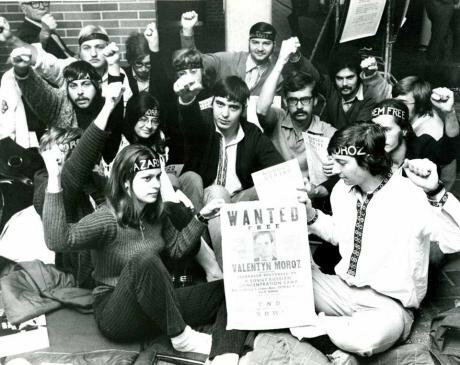 A 1972 hunger strike by Ukrainian Canadian students in support of Ukrainian political prisoners. This article was given as a paper at the “1968-2018: Militant practices East and West” conference held in Paris on 23-24 May 2018. In the late 1960s and early 1970s, a radical movement of Ukrainian socialists and anarchists emerged in Canada and northeastern USA. We were sons and daughters of the Ukrainian nationalist post-war emigration and the first generation to grow up in liberal democracies and to go to universities. We regarded ourselves as Ukrainian Canadian citizens rather than as immigrants, but in the process of our radicalisation we developed a strong concern for the situation in Ukraine as well. Our generation was swept up in the late 1960s and early 1970s by the student movement, the protests against the war in Vietnam, the movements of African Americans and First Nations, the feminist movement, struggles for multicultural rights and the Quebecois national movement, by the counterculture that defied traditional authority, conformity and conservative social mores. We followed what was happening in European countries east and west, including France and Czechoslovakia, the Soviet Union. The generation of the 1960s in Ukraine, the shistdesiatnyky (lit. “people of the 60s”, the 1960s cultural and political movement for self-determination) had a particularly strong influence upon us. We read their work, Lina Kostenko, Ivan Dziuba, Vyacheslav Chornovil, Lev Lukianenko and Ivan Kandyba. We knew they protested the invasion of Czechoslovakia in 1968 by Warsaw Pact troops, and that the crushing of the Prague Spring was also the beginning of further repression against them as well. They were central to our understanding of Ukraine, because they told us something quite different from what our parents had told us. They were a key to our radicalisation. From out of this broad international experience there appeared a more politicised and self-organised group with an agenda to fight for our rights in the diaspora and for our aspirations for Ukraine. With respect to the latter our unifying slogan was “For Democracy and Socialism in an Independent Ukraine”. Our strategic objective was to challenge the monopoly on dialogue between East and West held by the ruling classes of the USA and USSR, to break down the isolation of the democratic, national, workers’ and civil rights movements in the countries of the Warsaw Pact and defend them from repression. We aimed to make these movements in the Socialist Bloc better known in the west, to promote an independent dialogue between the new emancipation movements in the west and east, and to organise international solidarity and practical aid with our counterparts in the east. Our methods were protest actions organised by a network of Committees in Defense of Soviet Political Prisoners, the publication and distribution of an English language journal about Ukrainian affairs (META) and a Ukrainian language journal (Diyaloh) of information, analysis and debate about major developments in international politics and opposition movements in the east. We organised the clandestine transport and distribution of literature, typewriters and basic printing equipment to opposition groups in Poland, Hungary, Czechoslovakia, Yugoslavia and the Soviet Union. We co-operated with opposition groups in exile from these countries and with western socialist organisations. We transported their literature as well as ours into Eastern Europe. A number of our members moved from Canada to study or live permanently in Western Europe in order to conduct this work. We remained a small group of some 25 members. Our public and clandestine work lasted for some 13 years, until 1985. By that time the wave of radicalisation that started in the 1960s had subsided. We did not quite reach the time of glasnost and perestroika in the Soviet Union as a unified and still active collective. What is relevant from our past experience for today? What are the continuities and absences and how do we formulate new perspectives and new objectives for our work? We did achieve some of our goals, such as helping secure the release of political prisoners like Leonid Plyushch and Piotr Grigorenko. We were told by them and by other prisoners afterwards that their conditions of incarceration were less intolerable because the authorities knew and they themselves knew that people in other countries were campaigning for their release. This meant that international solidarity was effective and worthwhile, even though the governments that imprisoned the people we were defending never admitted it. Activists today in both Russia and Ukraine who are marginalised and repressed can be better protected and heard if they are better supported internationally, from abroad. A permanent campaign of international solidarity is needed, in the first instance with those are in prison and enforced exile. What is still valid of the broad objectives adopted by our group in the 1970s: democracy, socialism and independence? All three of them, but in a radically altered socio-economic and state political context. The Soviet Union has collapsed. A new wave of emigration has arrived in western Europe and North America. Ukraine became a formally independent state. There is a new and corrupt ruling class in Ukraine that exploits the labour of society, violates its democratic rights and fails to protect its national sovereignty against a resurgent Russian state. The Orange Revolution in 2004 and the Revolution of Dignity ten years later failed to dislodge it. Where once Ukraine was embedded in the Soviet Union, on its side of the Cold War, today Ukraine is the object of inter-imperialist rivalry between Russian and western imperialisms, in neither camp but on the front line between them. The Ukrainian ruling class is pulled in both directions into the projects of regional expansion and hegemony of both competing camps (NATO, EU, Eurasian Economic Union, Russian security sphere). These rivalries between the West and Russia dominate international discourse. As in the time of the Cold War, there is still a need for an independent international observatory on the current situation inside Ukraine and the country’s place in the interstate system and global economy that takes as its standpoint the interests of Ukrainian society as opposed to those of its ruling class. This kind of observatory could be organised by a coalition of activists abroad to produce and disseminate its own criticism, analyses and policy proposals as well as those of the independent labour movement, human rights groups, the LGBT community and others in Ukraine. We still need to recover the radical Ukrainian tradition that is rooted in the philosophy of universal emancipation, to contest the integral nationalist and racist tradition of the far right. This is a difficult undertaking in the wake of the historical catastrophe of Stalinism and the failure of transition to the western model of democracy and the market. Our small group in the 1970s adopted socialism as one of our objectives as a result both of the influences upon us from our immediate Western milieu and of our own rediscovery of the Ukrainian vernacular socialist tradition, the one that contested Stalinism and was almost completely annihilated by it. The latter came to us from our study of the 1917 Revolution, the 1920s in the Soviet Union and the nationalist movement in the Second World War. We confronted the blank spots and falsifications of history that were created by the Stalinist and integral nationalist schools. These blank spots and falsifications still leave a deep mark on the consciousness of the present young generation in the east and west. The rewriting of history goes on today in Ukraine, but now it is done under a new ideological imperative articulated in the Decommunisation laws and the Institute of National Memory. Historical scholarship, if we can call it that, is harnessed to provide legitimacy to the new Ukrainian ruling class and to outlaw its critics. And finally, we need to ask ourselves why so much of the Western left fails to protest against the crimes of Putin’s regime as it does religiously against US imperialism. Who is defending today’s victims of repression and political prisoners in Ukraine and Russia, not to mention Belarus, Kazakhstan and elsewhere in the east? There is the deeper problem than simply the lack of awareness: every historic wave of revolt against the established order disintegrates and is reincorporated into the status quo again. This process leaves behind a residue of political actors who speak in the language of their former radicalism but in the interests of one or another part of the status quo. In international politics, this is the phenomenon of campism. One of the main obstacles that we Ukrainian socialists faced when we were trying to defend Soviet political prisoners in the 1970s and 1980s came from some of our fellow comrades in the left. Their response to our condemnation of Stalinist repressions was to argue that the repressions carried out by Western state agencies like the CIA in Latin America were even worse. This kind of moral relativism was in fact an apology for Stalinism, an exoneration of its crimes, and indeed a judgement that the USSR was a superior, more progressive and humane civilisation than advanced Western capitalism. It was a veiled campism, a political orientation in favour of protecting the Soviet Union’s ruling class from the alleged danger of a restoration of capitalism posed by its domestic critics, the dissidents like Andrey Sakharov, Pyotr Grigorenko, Leonid Plyushch and Mustafa Dzhemilev. As it turned out, it was the Soviet Union’s ruling Communist Party that restored capitalism, not the Party’s critics. The Western left today is a pale shadow of former self in the 1970s. Some even question whether it deserves to be called “left-wing” any more. However, we do still confront the campist orientation among its remnants, this time in the form of defending Putin’s regime in Russia and its actions in Ukraine, Syria and elsewhere. So, if we are to be effective in our defense and solidarity work today we must confront left-wing Putinism, this contemporary campism. It ranges across a whole spectrum, from obscurantist nostalgia for the Soviet Union to the actions of a Western lobby cultivated and funded by the Russian state itself.